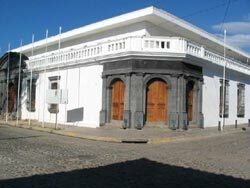 Suchitoto is located in the department of Cuscatlán (the smallest one of the 14 departments of El Salvador), at 47 km from the San Salvador. Suchitoto means "place of the flower bird" in Nahuatl. The town is located at 390 m ASL on the south border of the River Lempa, from where the mountain range Alotepeque - Metapan offers spectacular views, as well as Lake Suchitlan (longest lake in the country, with over 135kms2). 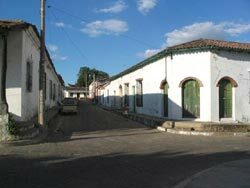 Suchitoto was founded by pre-Columbian Pipil populations who were defeated by Spaniards during the conquest. 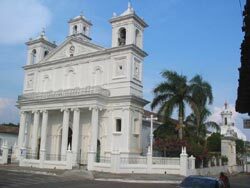 The church of Santa Lucía, built in 1853 is one of the first republican churches in the country (usually mistakenly called colonial, but after the independence from Spain was signed they were no longer referred to as colonial). The church went through reconstruction for some years and it is now open to the public. When in Suchitoto, you can visit lake of Suchitlan, take a boat ride and go to the Bird Island (isla de los pajaros), Los Tercios and the area known as La Bermuda only 8 km away (first Spanish settlement in El Salvador). Suchitoto was a very important town during the colony, some former presidents were born in this town, well known poets, and Alejandro Coto (film maker). Alejandro Coto is the person in charge of the cultural movement in the city; he began a permanent festival of arts and culture, his house currently a museum, will be inherited to the city of Suchitoto after his death. Suchitoto is very popular among foreigners and locals. There are many kinds of hotels and restaurants with amazing views. Near the Main Square in Suchitoto. 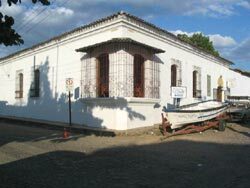 Located in Suchitoto, 4 blocks north of the Central Park. Family run hotel in the center of Suchitoto. We provide personalized tours in El Salvador. We can arrange your ideal holiday.